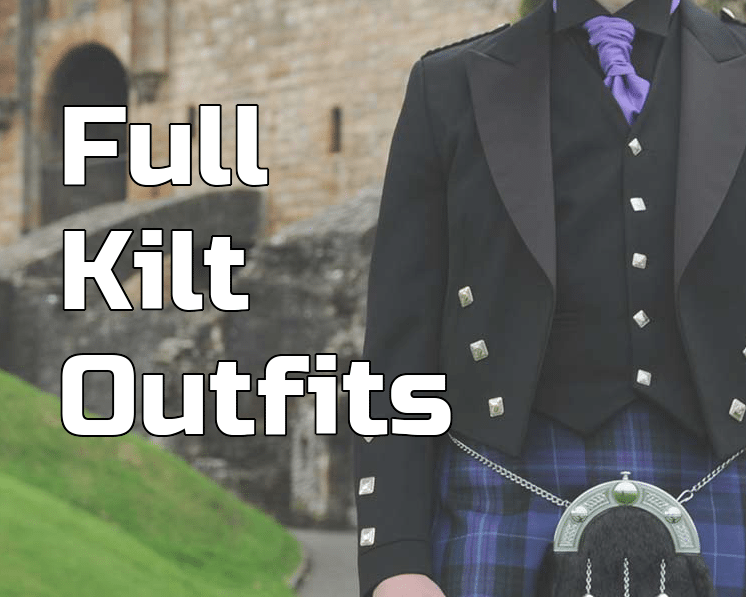 Whether you require a full kilt outfit, or accessories to add to your kilt, we're sure you will be able to find what you're looking for! Looking to buy a kilt? Here are our best selling kilt products! We sell only the finest Highland products to customers. If you don’t know much about Scotland’s national dress, selecting a kilt can be quite a daunting process. With so many tartans available, aswell as a styles of, means there are a multitude of options to consider. But don’t worry, the process is much easier than you will have probably expected! We have many years of experience in the industry, so you are in safe hands. Choose a tartan (plaid to you Americans). 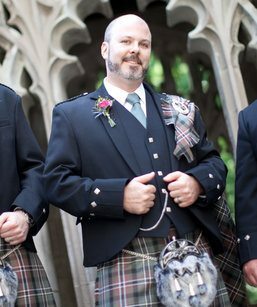 Before you go right ahead and look at the styles we have for sale, lets learn a little bit about the origins of Scotland’s national dress. 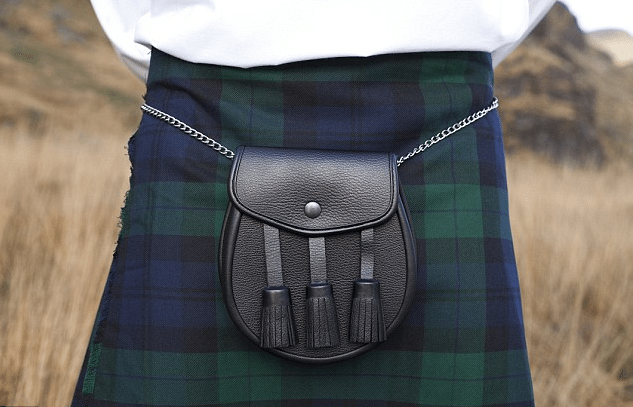 Kilts will forever be associated with Scotland, with the origins of this timeless, yet fashionable traditional dress going back many hundreds of years. 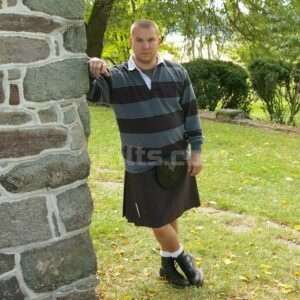 One style to consider is the “Great Kilt”. This is possibly the most authentic style you can buy. 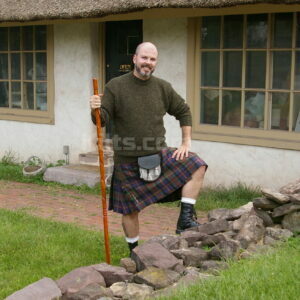 This was the original garment that Scottish people wore when kilts were first used. In order to wear this garment, it had to be laid out on the floor and rolled. As such, it is “untailored”, where more modern styles that are now for sale are tailored to your own measurements. While this style is not as popular to wear in recent times, this is how the garment was originally worn. They use less fabric – normally 4-8 yards of fabric, but this can vary. 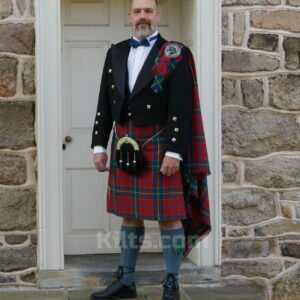 Because there is less fabric, the modern style is a lot easier to put on and take off compared to the unrolled “Great Kilt”. 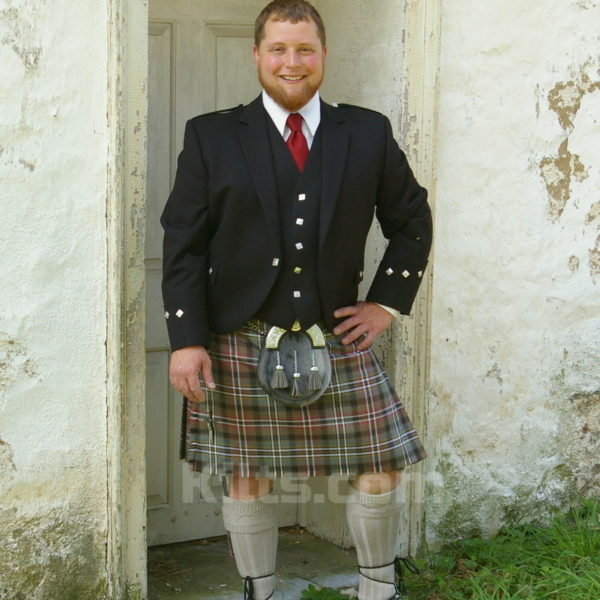 Modern styles use a waistband, which makes the kilt easier to fit, and is therefore a lot more comfortable. We are able to offer both the styles to our customers. It’s really up to you which style you prefer. Both styles are authentic and commonly used in Scotland. 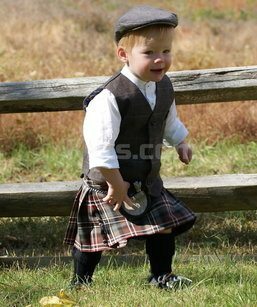 There are also many casual kilts that have become available, which are more suited for everyday use. Traditional products are made of woven wool. This is often the most hard wearing material, but is often the most expensive. If you are looking for an authentic product, then it is important for woven wool to be used. If you don’t have the budget for traditional woven wool, then there are other materials that you could use, such as polyviscose, which is a mix of polyester and viscose. Once you have looked at the different styles that are available, and selected the style you like, you should then choose the tartan (plaid) that you’d like to have. Tartan can be best described as the criss-cross pattern made up of different colors. Each unique pattern is then assigned a name, with many tartan designs being attributed to a family name (clan), such as McDonald or McPherson for example. Back when the garments were first coming into prominence, each clan had a weaver that would make the material and these weavers governed how the material would look. These weavers drew inspiration from the local environment, often using the dyes of plants found in their area. Because of Scotland’s diverse fauna, and since the weavers had access to different plants compared to other communities, many different types of tartans were produced in order to reflect their area. As time went on, and dyes became more advanced, the tartan designs started to become more extravagant, which resulted in the colorful designs that we see today. If you have searched for your family name and don’t like the tartan that your name is associated with, then don’t worry! There will also be many of you who will not have a tartan associated with your family name. Therefore, it might be a good idea to choose a neutral tartan that is representative of Scotland, such as the Blackwatch tartan, which is synonymous of the Scottish Kilt. We’re sure you’ll be able to find a tartan that you will love and that has special meaning to you. Often the most challenging procedure in the process is getting measured up. Made to measure styles will be a lot more comfortable for the wearer, and probably most importantly, will also look better as well. Waist – Measure the diameter of your waist at your bellybutton and record the measurement. This means putting a tape measure at the start point (the belly button) and wrap it round your waist until the tape measure comes back to the bellybutton. Length – Measure the length between your bellybutton and the middle of your knees. 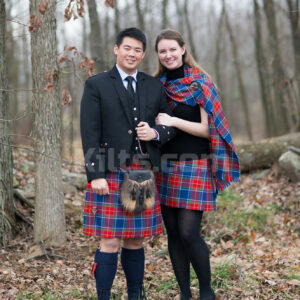 Some women prefer to wear a kilted skirt, which looks as equally as stylish and fashionable. When a female is measuring for a kilted skirt, the only really notable difference will be the length of the garment, as well as where it is placed on the waist. 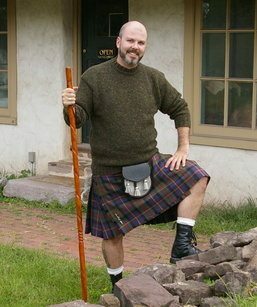 Kilted skirts, for example, measurements tend to be taken from the bottom part of the waist, rather than the bellybutton when males are being measured for. Once you have decided on the style, tartan, material, and noted down your measurements, you are now in a position to think about accessories. 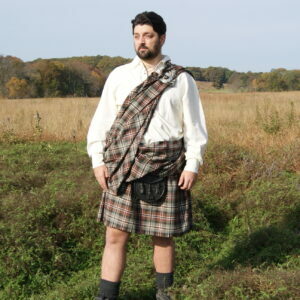 Many people who wear a kilt often choose to wear something called a “Fly Plaid”. For those of you who don’t know what this accessory is, it is basically an elongated piece of fabric, almost like a scarf. These “fly plaids” first came into prominence in the 18th century. This was also the time where more modern styles tended to become more popular. 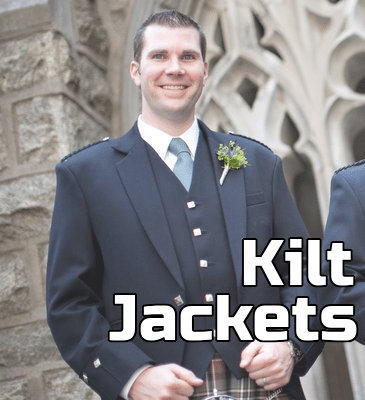 The Fly Plaid is worn by pinning the fabric to the chest of the wearer, normally held in place with a brooch of some kind, and then draped over the wearers shoulder. The next accessory to consider is the sporran. If you are going to wear an accessory, the sporran is possibly the most important to complete the look. 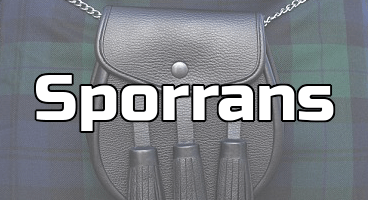 A little known fact (even to Scottish people) is that the sporran is Gaelic for “purse”. This is traditionally where the wearers effects are stored, such as money, wallets and hip flasks. Sporrans are quite essential. More modern sporrans are made of leather, but traditional sporrans were made out of animal fur. Sporrans are typically worn around the waist, and tend to drop a little so that they are hanging below the waist. There are many more accessories to choose from aswell, such as sgian dhus. We hope this guide has been helpful. Feel free to email us with any questions you may have.